Rendang is a dry type of curry. 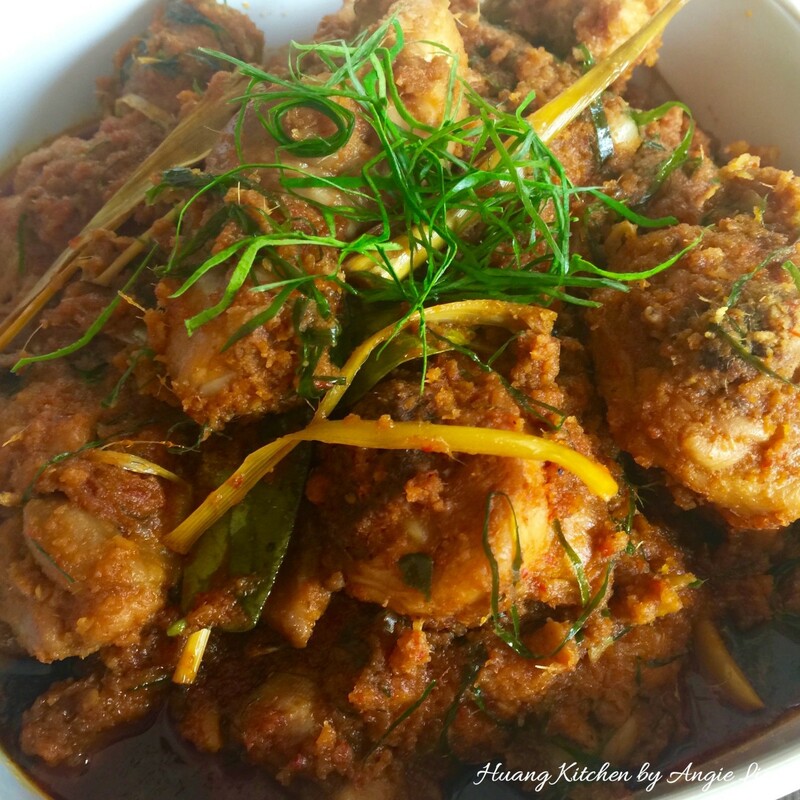 Traditional Malaysian Chicken Rendang is a version of dry chicken curry dish and is one of the specialties in Malaysian cooking. 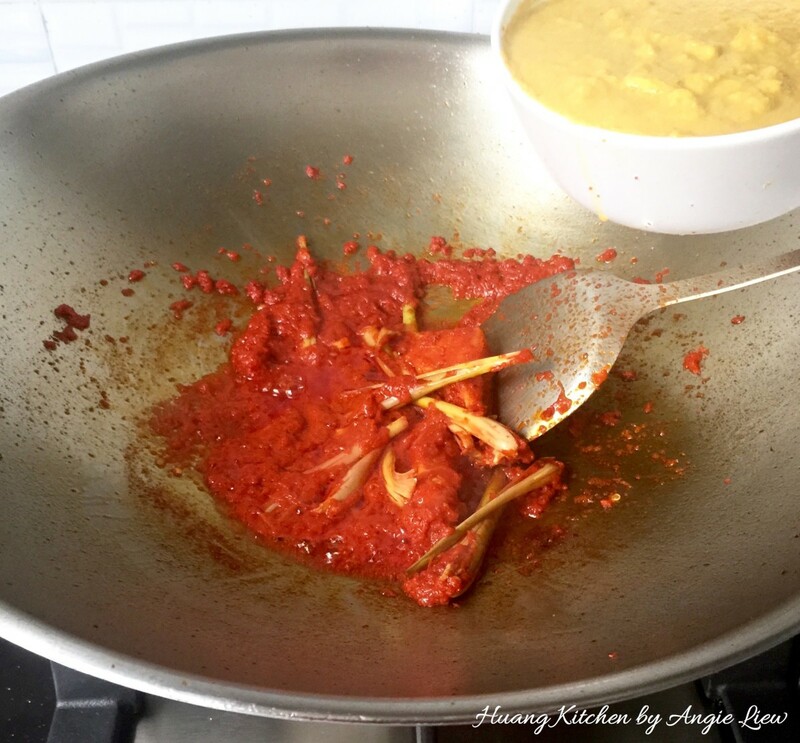 This Traditional Malaysian Chicken Rendang is so rich in flavours and spices that you will never have enough once it’s cooked. 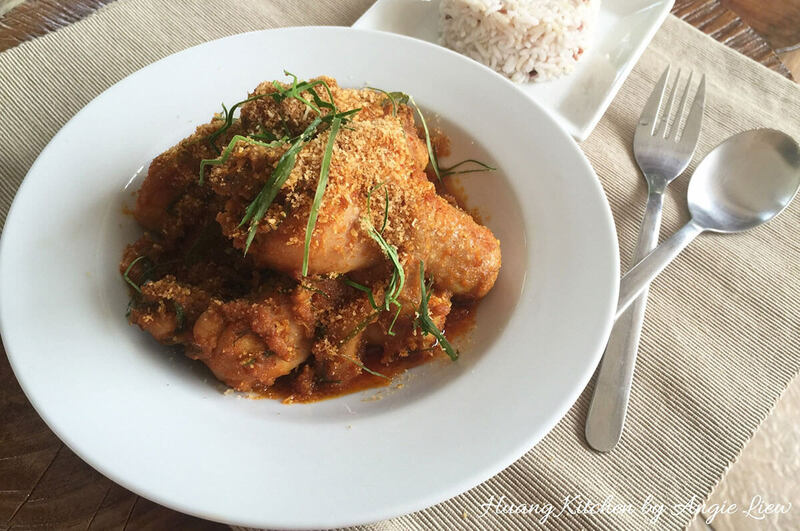 The spices used in cooking this dish also serve as natural organic preservation and together with the slow cooking of the chicken, this flavourful dish can be kept for a long time. 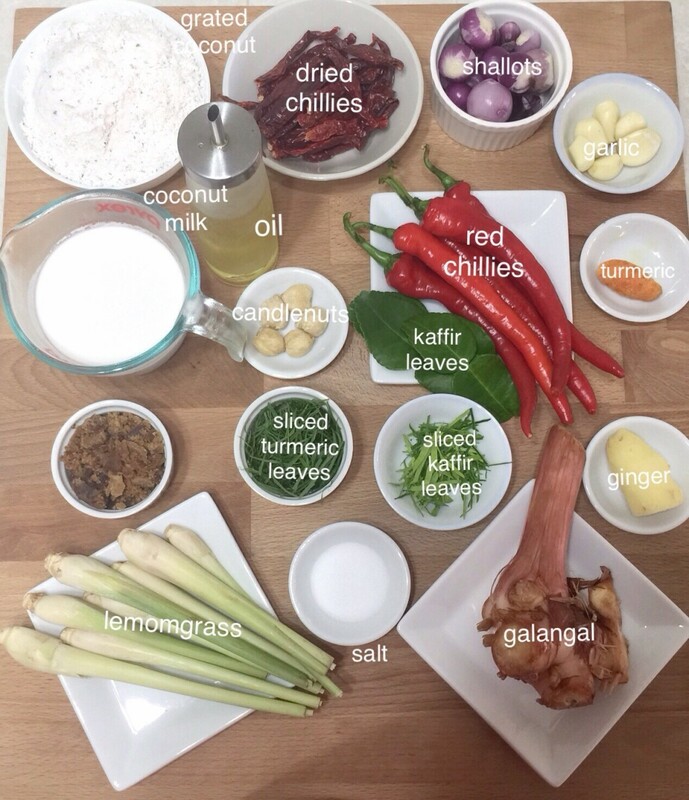 Traditional Malaysian Chicken Rendang is also a dish that is extremely versatile. 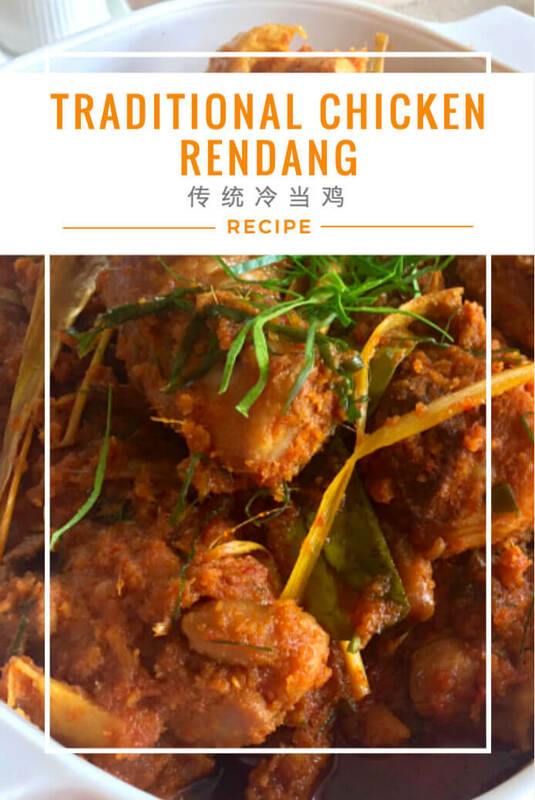 You can serve this flavourful rendang dish with steamed white or saffron rice, ketupat (a compressed rice cake) or lemang (glutinous rice cooked in bamboo tubes) and thick slices of bread. 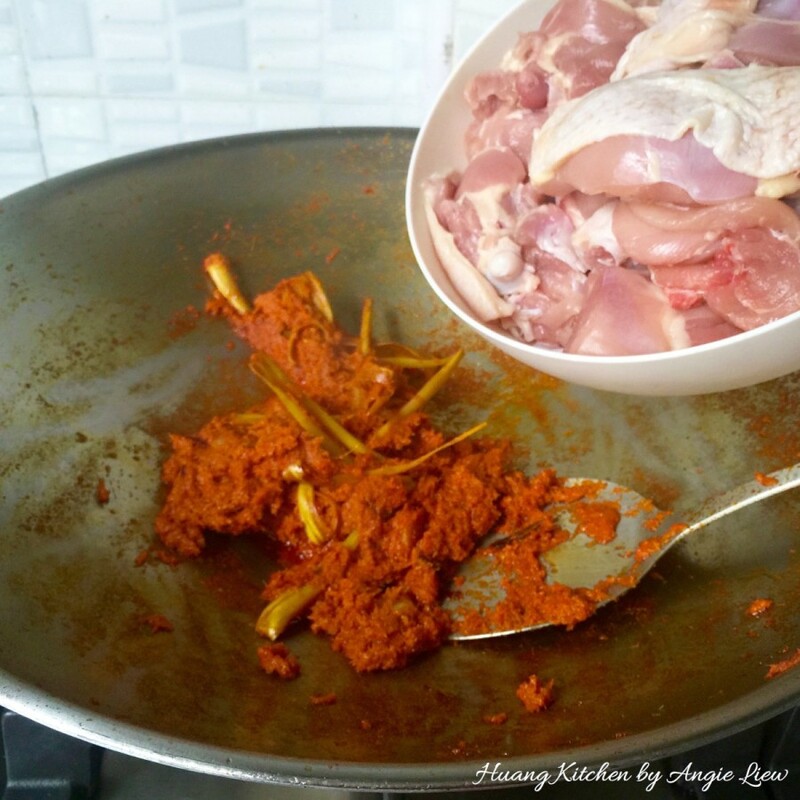 Cooking Traditional Malaysian Chicken Rendang involves pounding or grinding many types of spices as well as slow cooking and continuously churning the chicken meat until all of the liquids has evaporated and the chicken is done. Hence, it can be time-consuming and requires some patience. However, the outcome is just amazing especially with kerisik (toasted and pounded coconut) mixed in at the end of the cooking process. It is indeed a real treat especially for the curry lovers. The chicken pieces are slowly cooked in coconut milk and spices until almost dry, allowing the meat to absorb all the condiments. 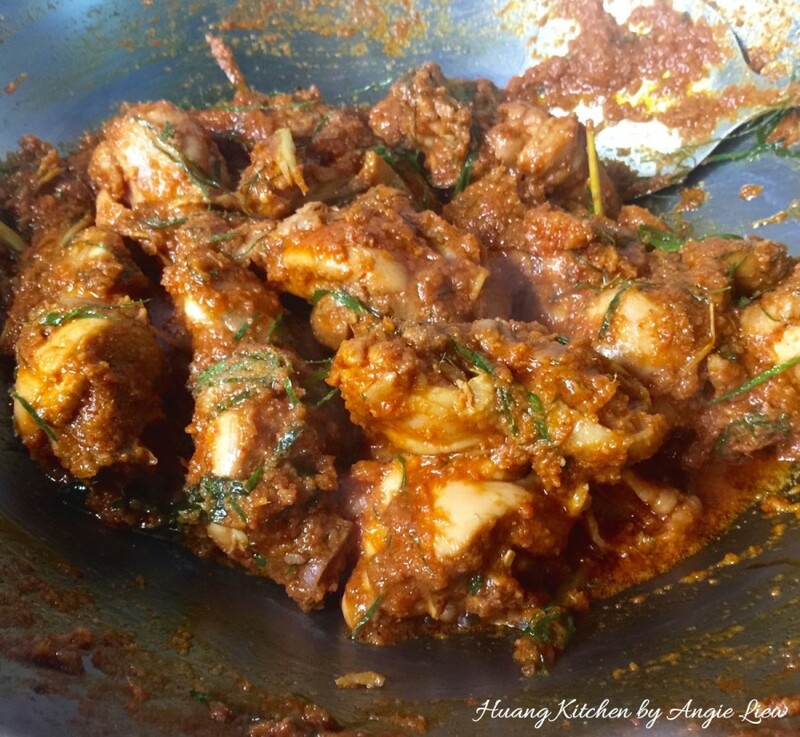 The slow simmering process allows the chicken meat to absorb all the spices and become tender. 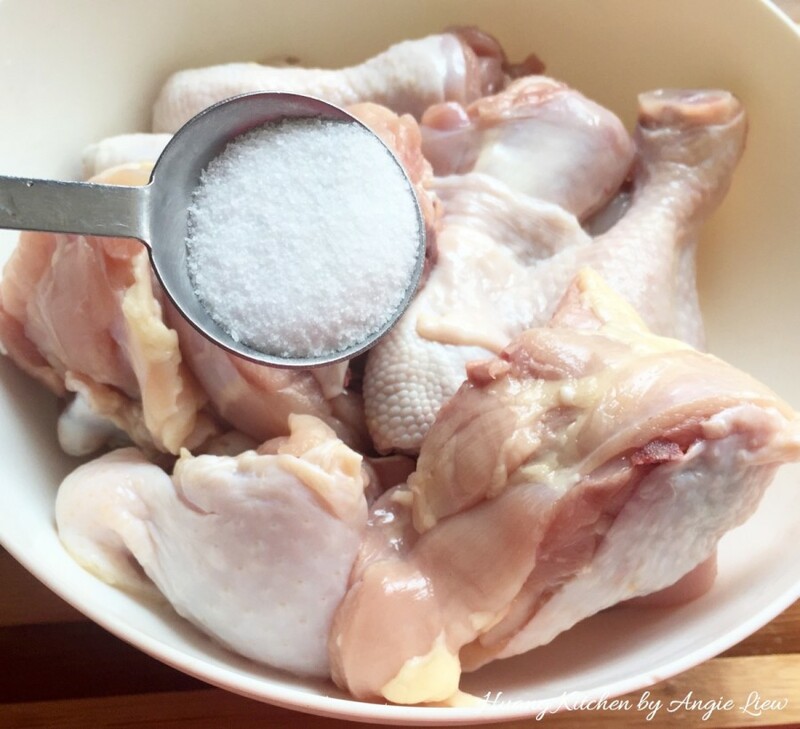 Great care however is required to ensure the chicken meat is not overcooked or burnt. 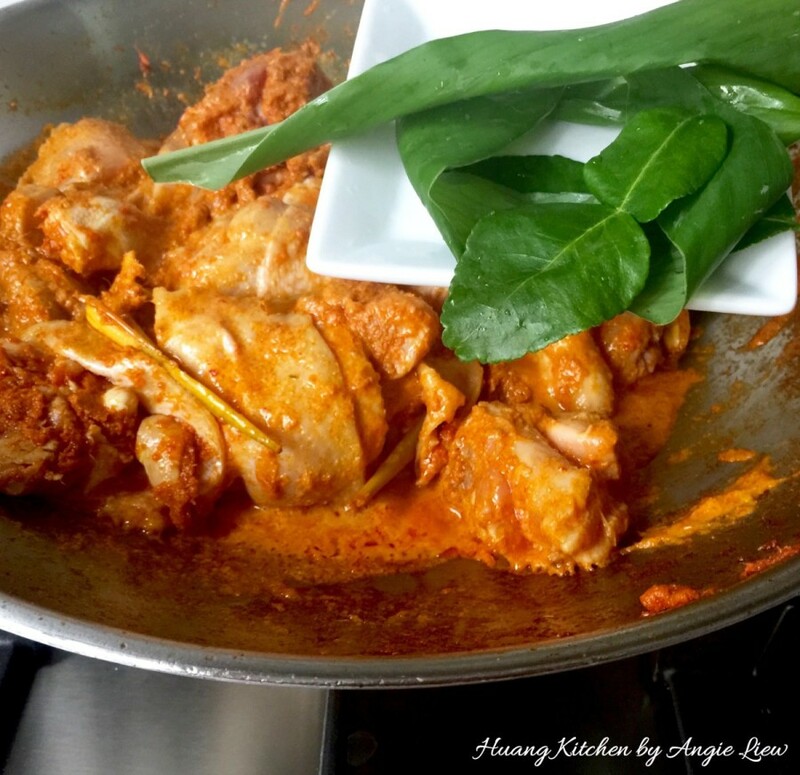 Because of the generous use of many types of spices, this Traditional Malaysian Chicken Rendang has a complex and special taste that is unique to Malaysian Cuisine. Traditional Malaysian Chicken Rendang is a must-have dish for my family whenever there is a family gathering or special occasion. On second thought, as it’s easy (although time consuming) and aromatic, we need not wait for an occasion to cook it anymore. Enjoy! 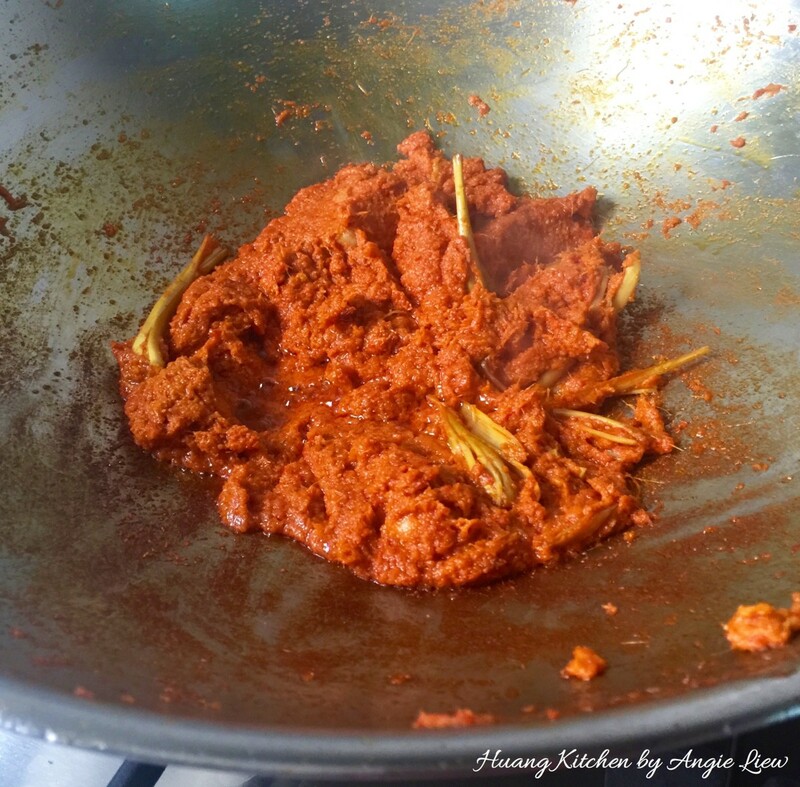 Rendang is a type of dry curry and one of the specialties in Malaysian cooking. 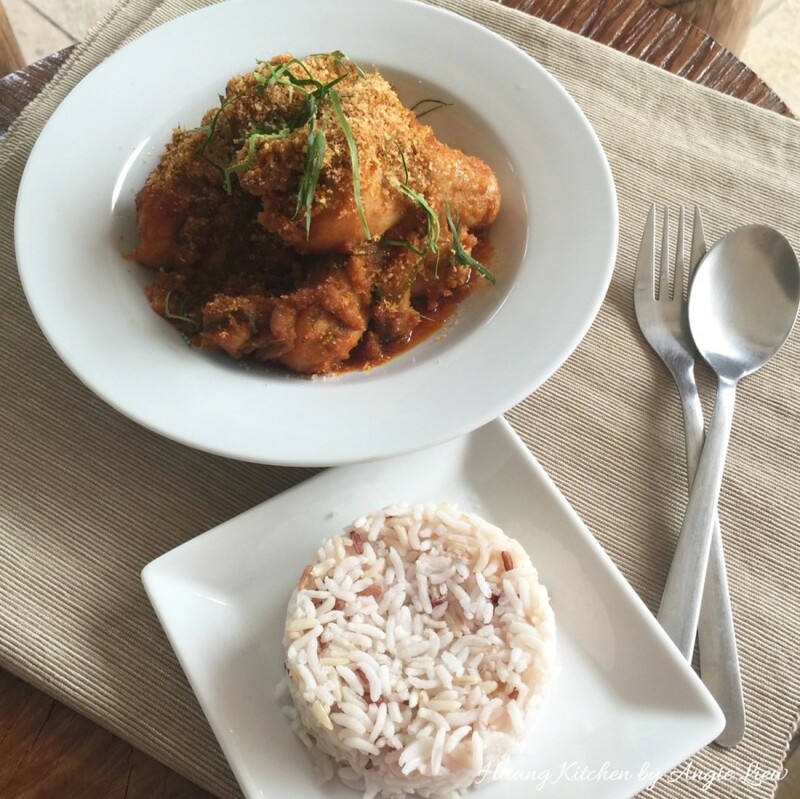 This Traditional Malaysian Chicken Rendang is so rich in flavours and spices that you will never have enough of it! First wash chicken and cut into pieces. 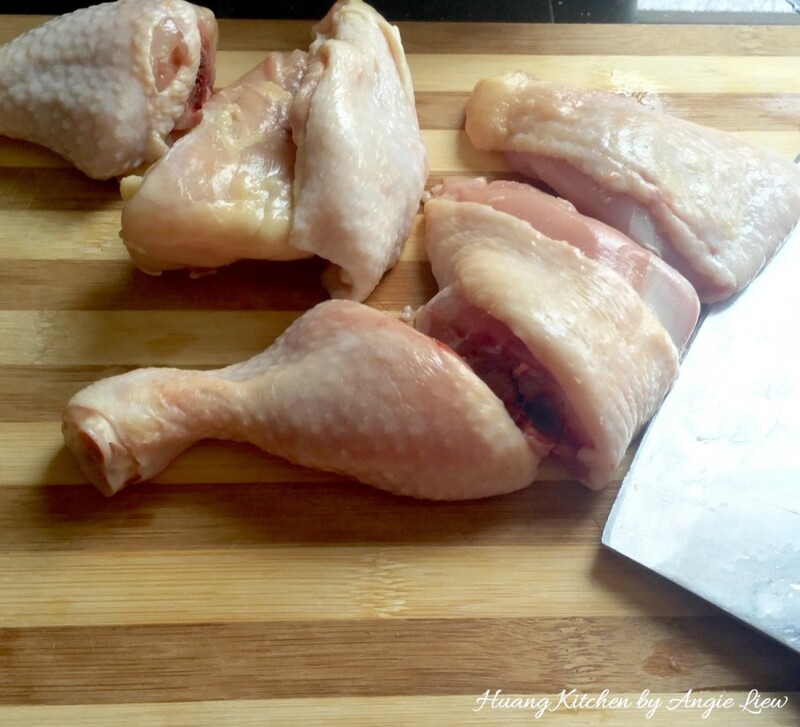 Chicken is normally cut into large pieces to allow for longer cooking and for the curry to dry out. Prepare all the spice (rempah) ingredients needed to make this dish. Cut all the spice ingredients to prepare for blending or pounding into paste. 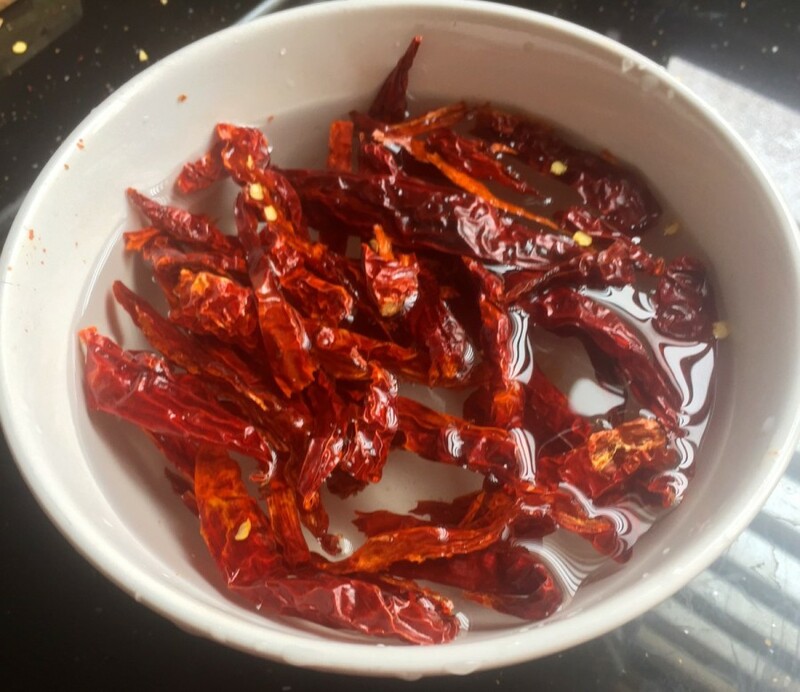 Remove seeds from the dried red chillies. Soaked the dried chillies in hot water till soft and drained. 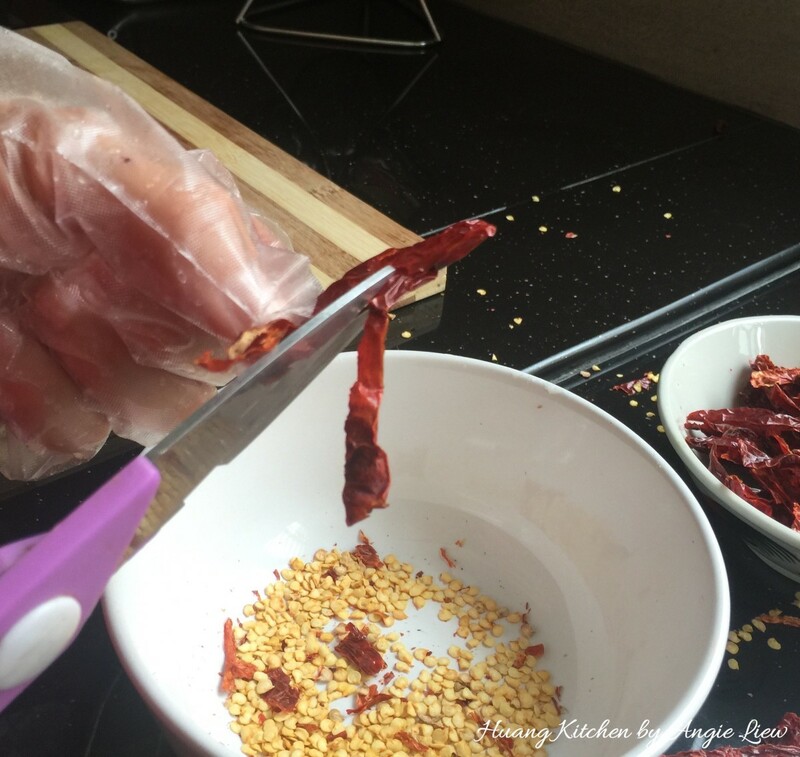 Remove seeds from red chillies and cut into smaller pieces. 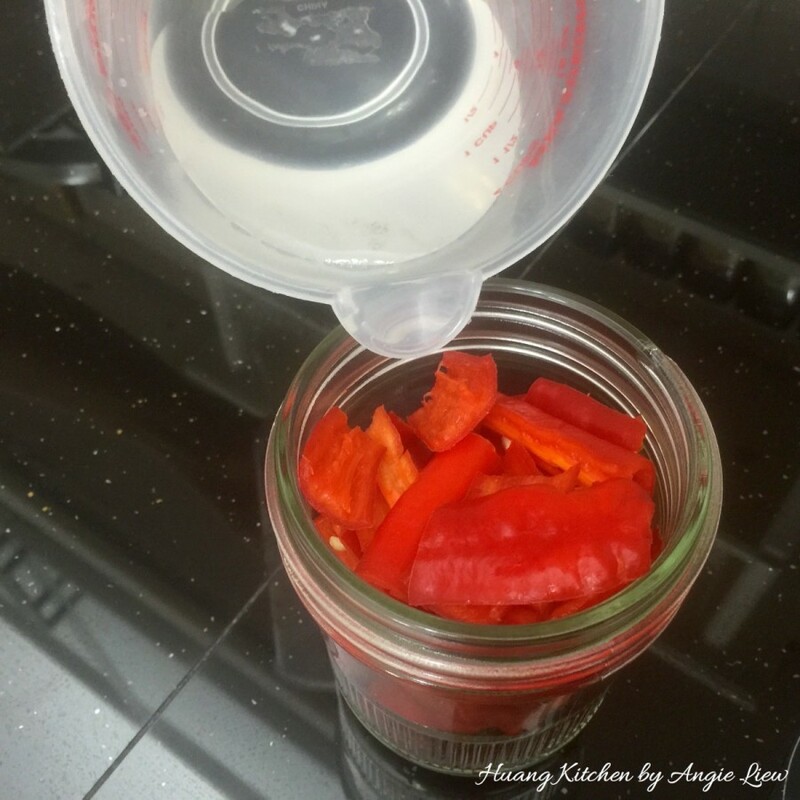 Place the cut dried and red chillies with some water added in a blender. Blend into a coarse paste and set aside. 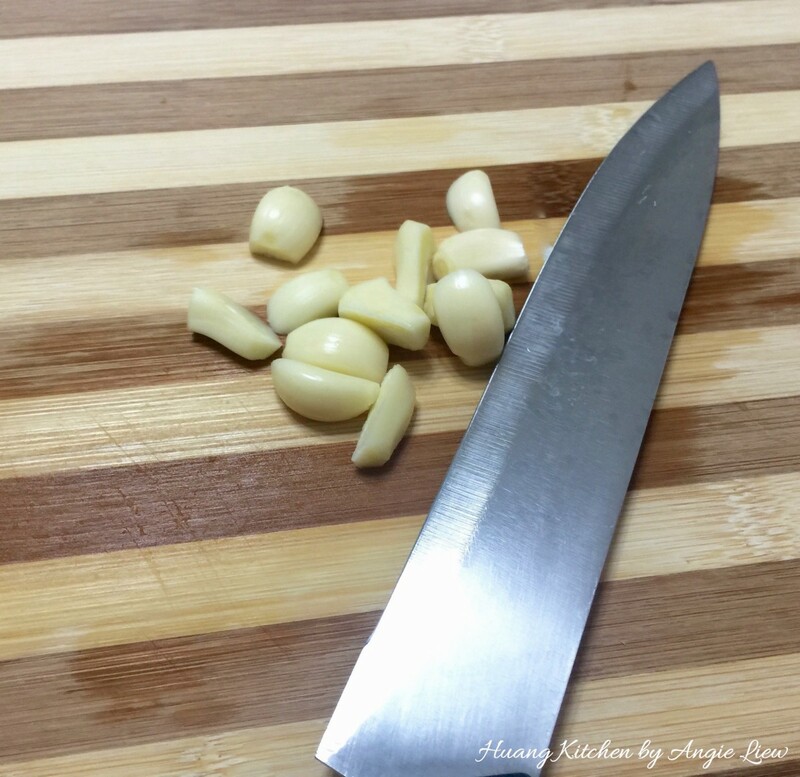 Remove skin from garlic and cut into smaller pieces. 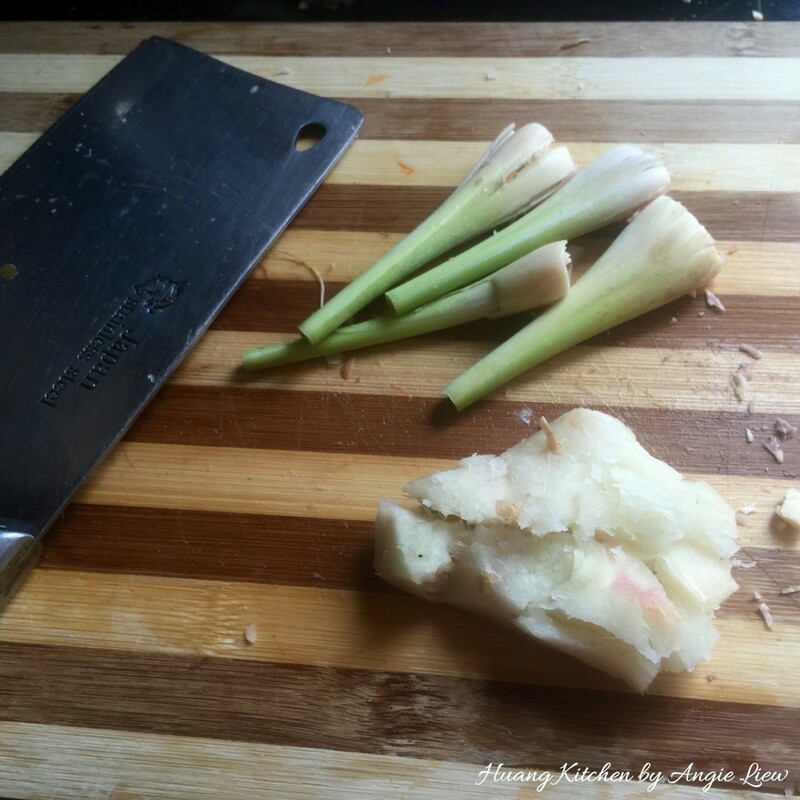 Remove skin and slice shallots into thin pieces. 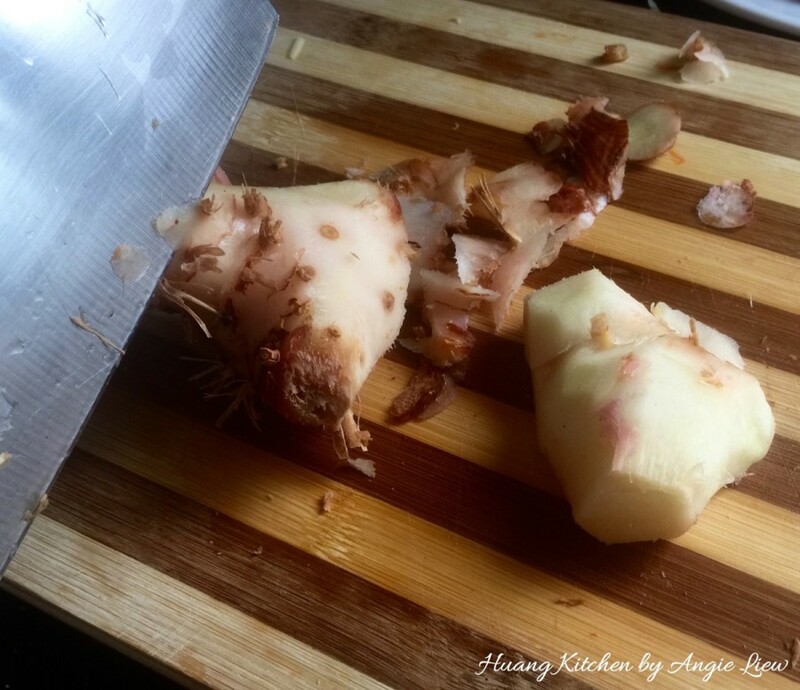 Wash the skin of galangal thoroughly. Scrubbed the skin till clean of dirt traces and cut into small chunks. Scape the edge of a spoon or knife against the ginger to peel off the skin. Then cut into small pieces. 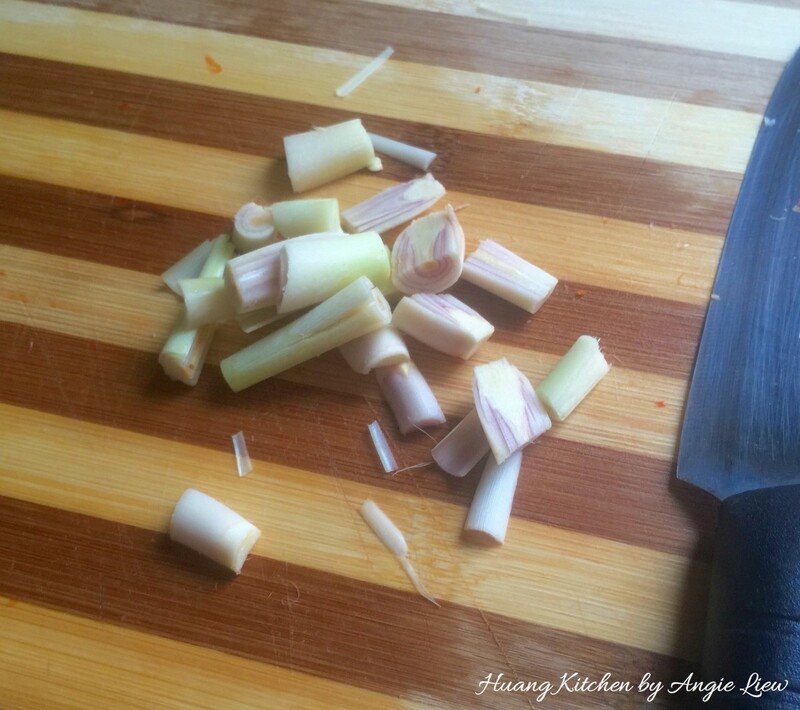 Wash thoroughly lemongrass under running water to remove all the dirt. Peel off a few of the outer layers from the bulb. 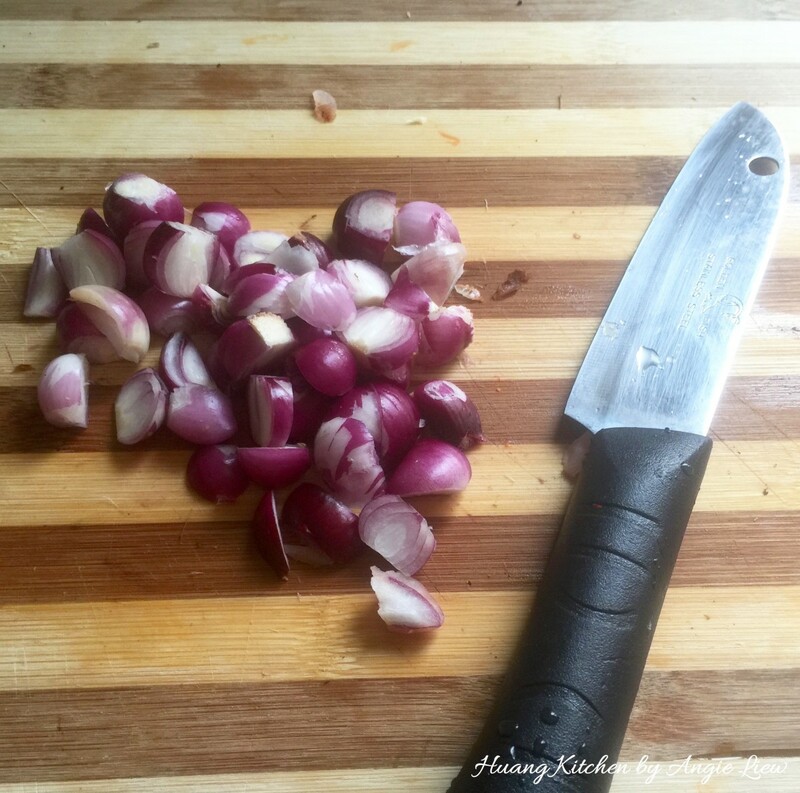 With a sharp knife, chop off a little of the beginning portion of the bulb and discard. Then chop the bulb into small pieces. 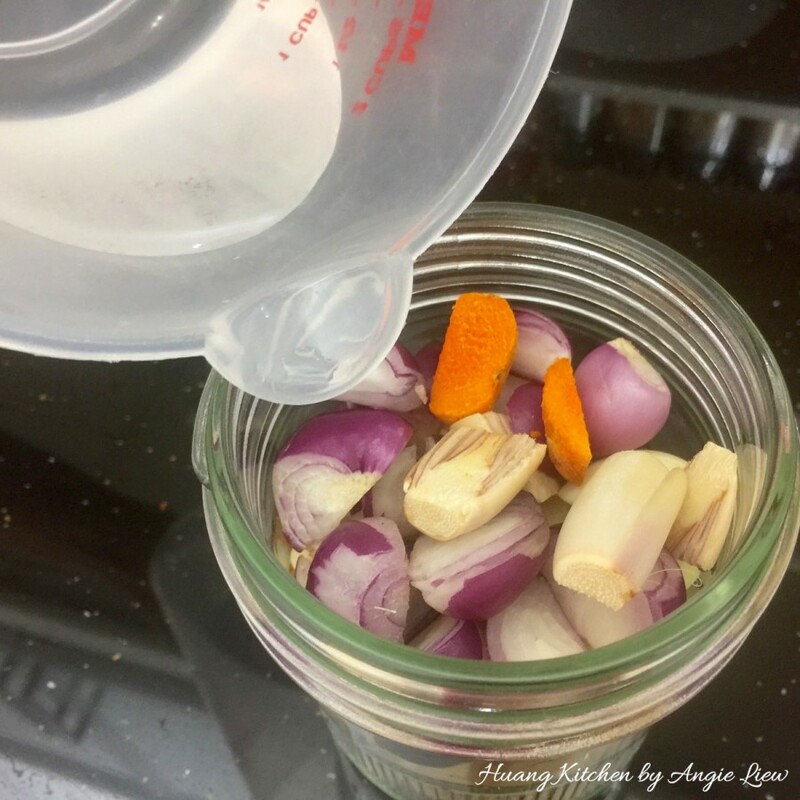 Place all the cut spices and turmeric piece into a blender with a little water added. Blend into a coarse paste. 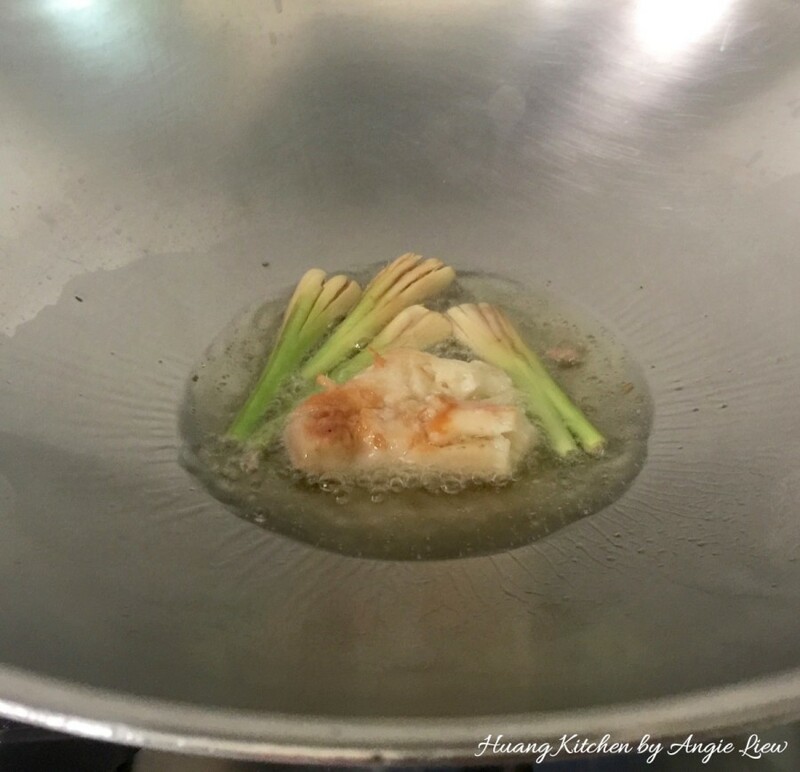 Also clean and crush another 3 lemongrass ( about 3 inches of the root end) and a piece of galangal (to be fried in the oil). Then set aside. Crushing helps to release the aroma from these ingredients. Remove the midrib and stalk of turmeric leaf. 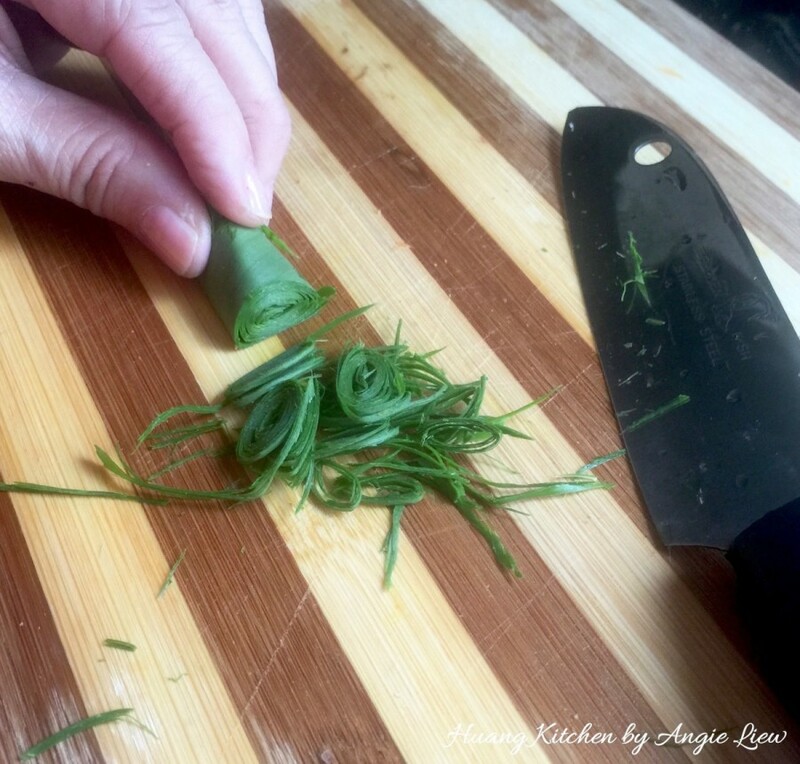 Roll the long turmeric leaf together and shred finely using a sharp knife. Also, remove the midrib and stalk of young kaffir leaves. 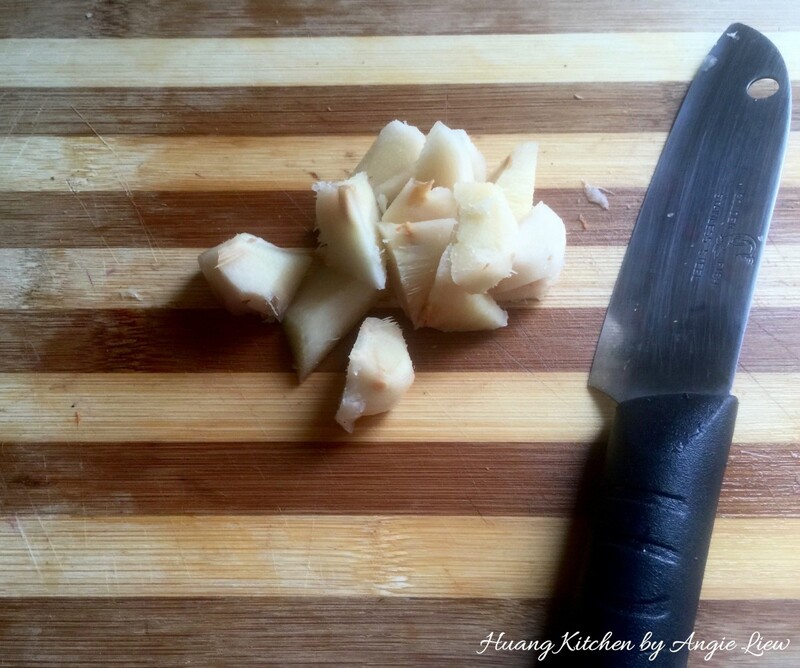 Roll together and slice thinly using a sharp knife. 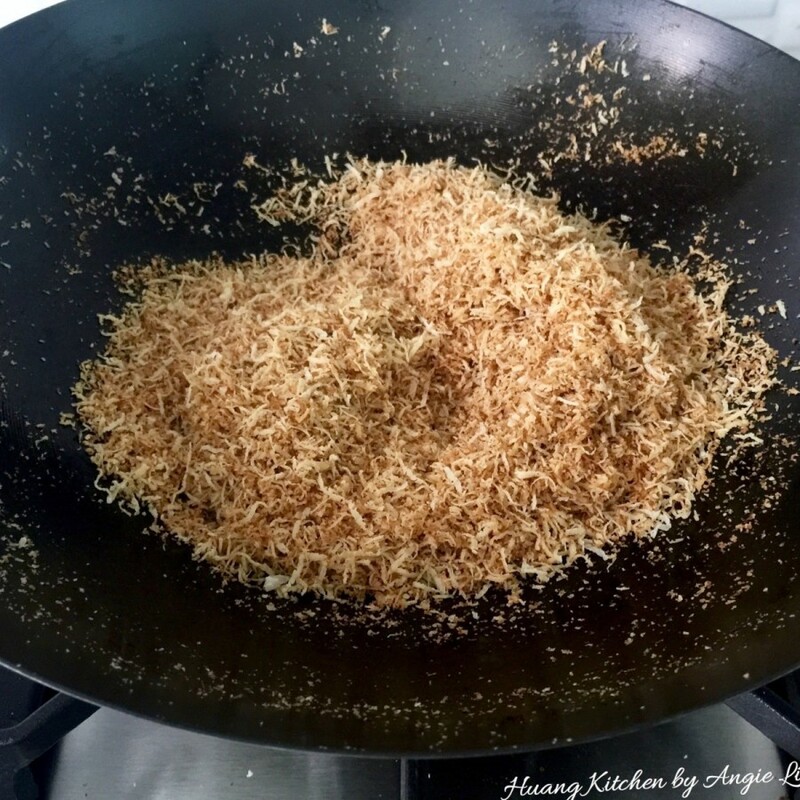 Add cooking oil into a heated wok over medium low heat and saute the crushed lemongrass and galangal until fragrant. 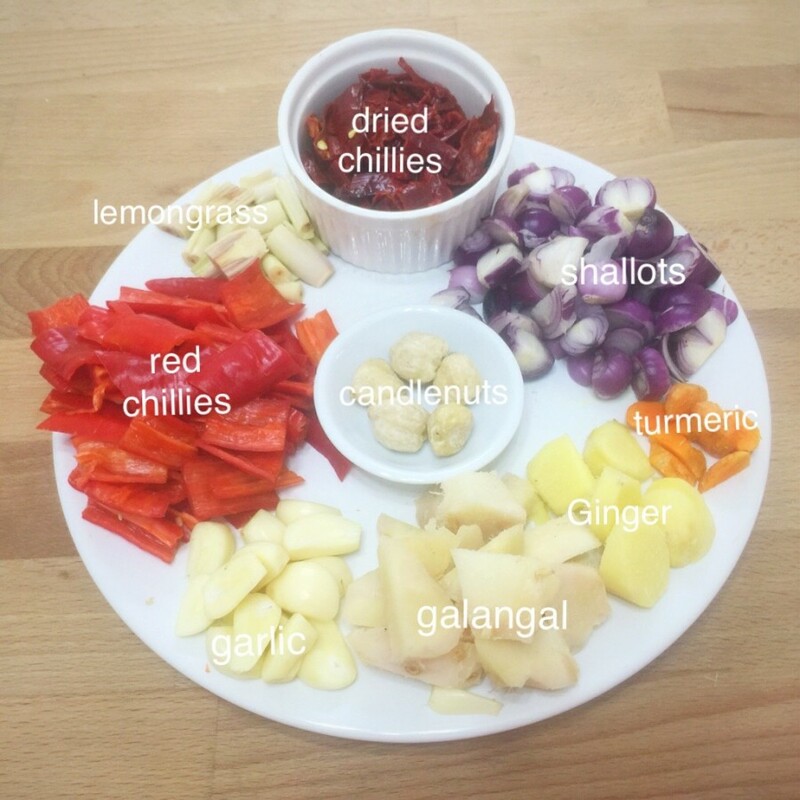 Then stir fry with the red chilli paste. Next, add in the blended spice paste. 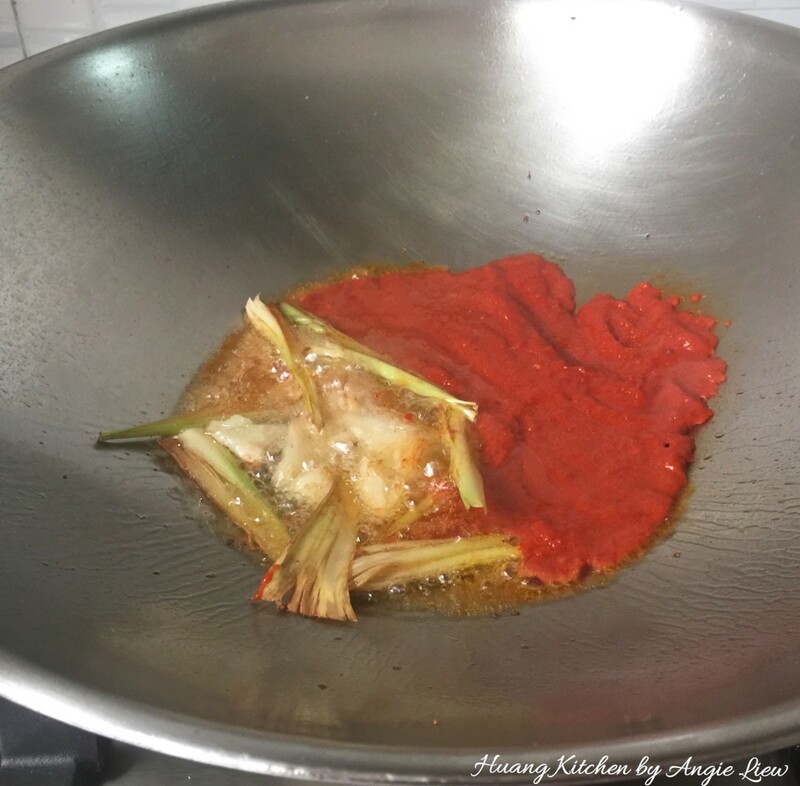 Mix all the spice ingredients together and continue to saute for about 5 to 10 minutes until aromatic and the oil begins to separate from the paste and the paste has darken considerably. At this point, add in the chicken pieces. Stir fry the chicken with the aromatic spice paste until the skin begins to brown slightly and all the chicken has been well coated with the spice. Then add thick coconut milk. Followed by the crushed kaffir and turmeric leaves. Next, add in palm sugar (gula melaka) or sugar. Continue stirring occasionally as you bring the curry to a boil. Then lower heat to low and leave to simmer UNCOVERED for 30 minutes. Stir constantly to make sure everything is cooked evenly and does not stick to the bottom of the wok. 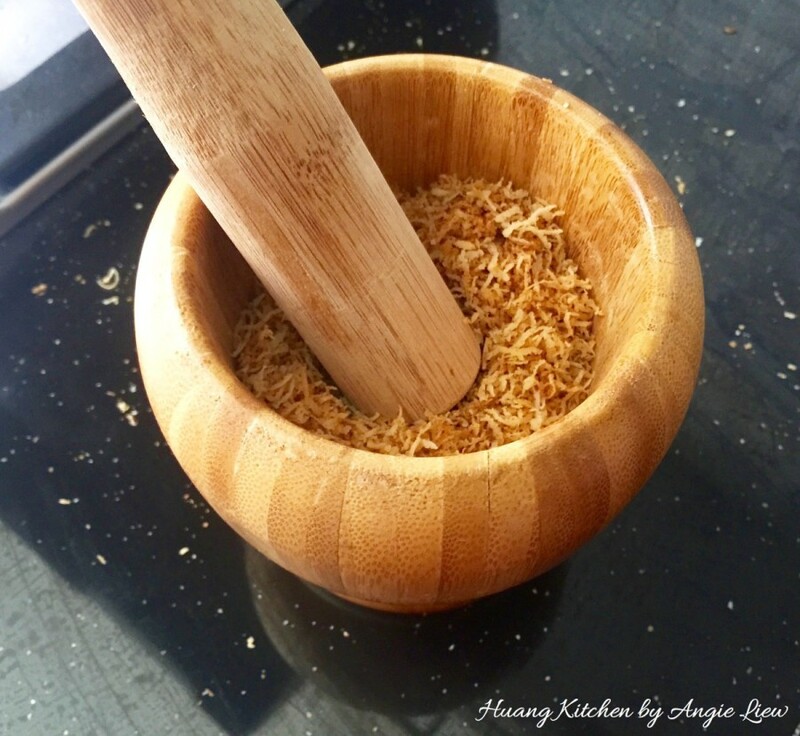 Meanwhile, prepare kerisik by dry frying freshly grated coconut under medium low heat until it is well toasted and turn brown and aromatic, about 10 minutes. Then pound the kerisik (toasted coconut) in a mortar as this will help release some of the oils within as well as to intensify the nutty aroma. Then set aside the pounded kerisik to cool before use. 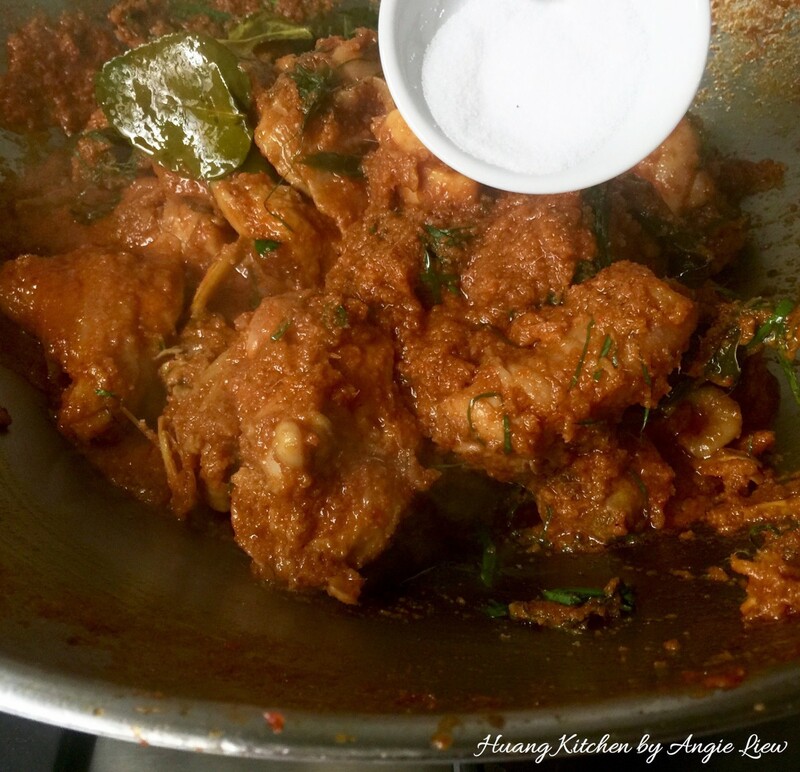 After 30 minutes, add kerisik and stir well to incorporate into the chicken rendang gravy. Also add in the finely shredded kaffir and turmeric leaves. Lastly, add in salt and adjust taste accordingly. Continue to cook for another 10 minutes until the chicken is cooked and tender and the gravy is thick and reduced. And we're done! Dish out onto a serving casserole garnish with finely shred turmeric leaves and kerisik for added flavour. 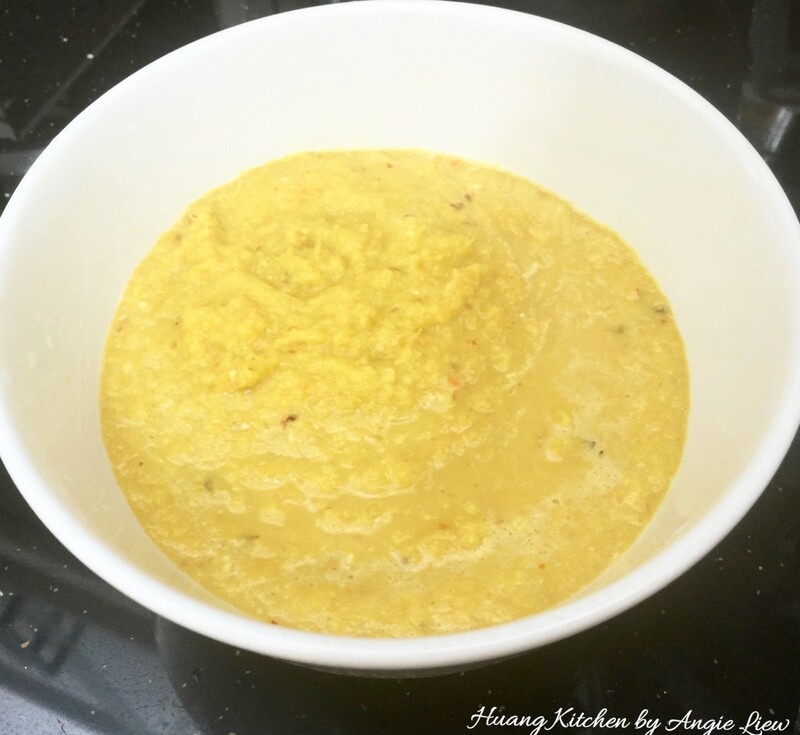 Serve with steamed or saffron rice. As always, ENJOY! All spices are to be washed and dried before blending. 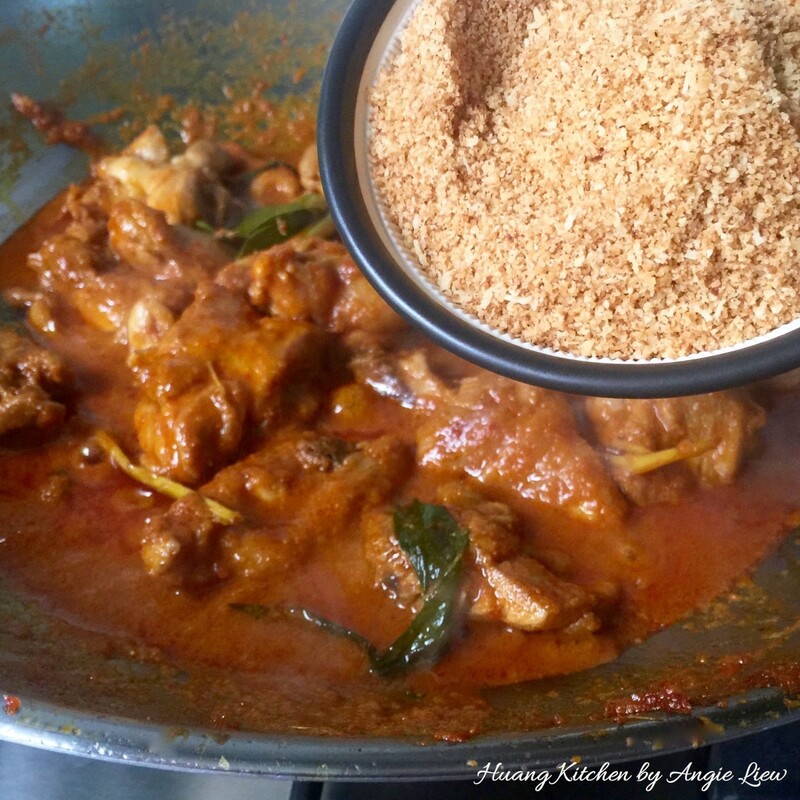 Be sure to use enough oil as it ensures that the spice (rempah) cooks evenly. 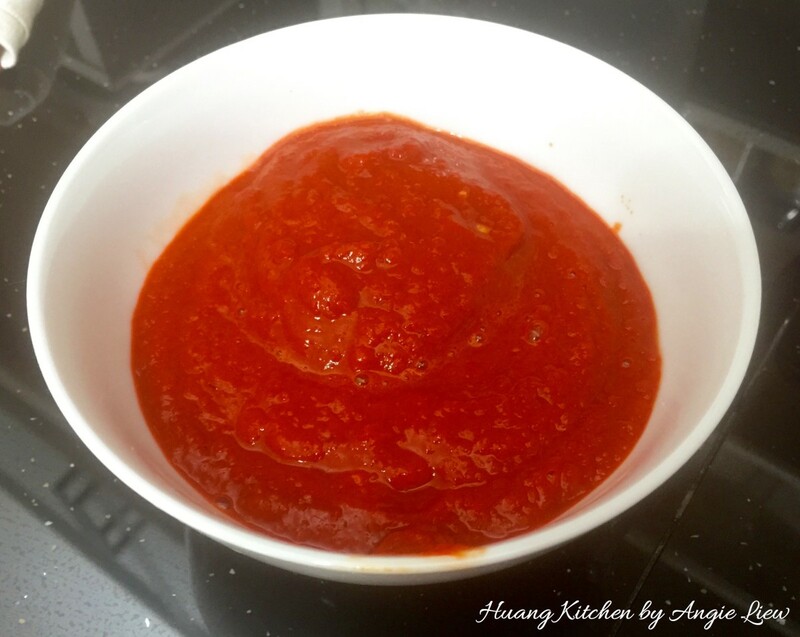 The spice is sufficiently cooked when the oil separates from the paste forming two distinct layers. 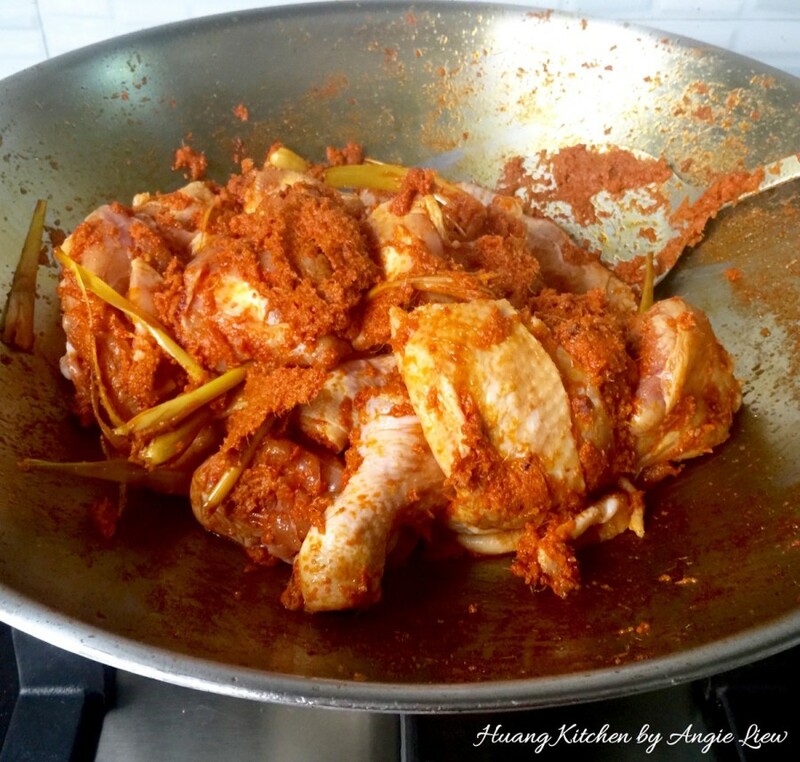 Do not cover the wok while simmering the chicken rendang as we want the sauce to reduce and become thick. 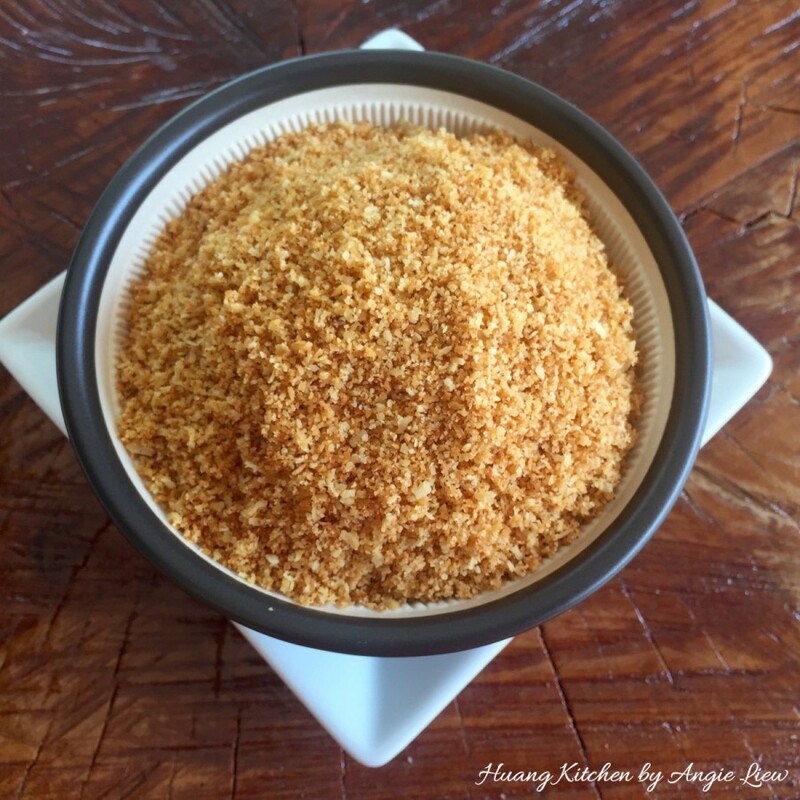 Kerisik (toasted grated coconut) is an absolute must in all renderings as it renders a distinct fragrant nutty aroma, imparted through the toasting of the grated coconut. Kerisik can be made ahead of time and it can be stored in the freezer for months before use. 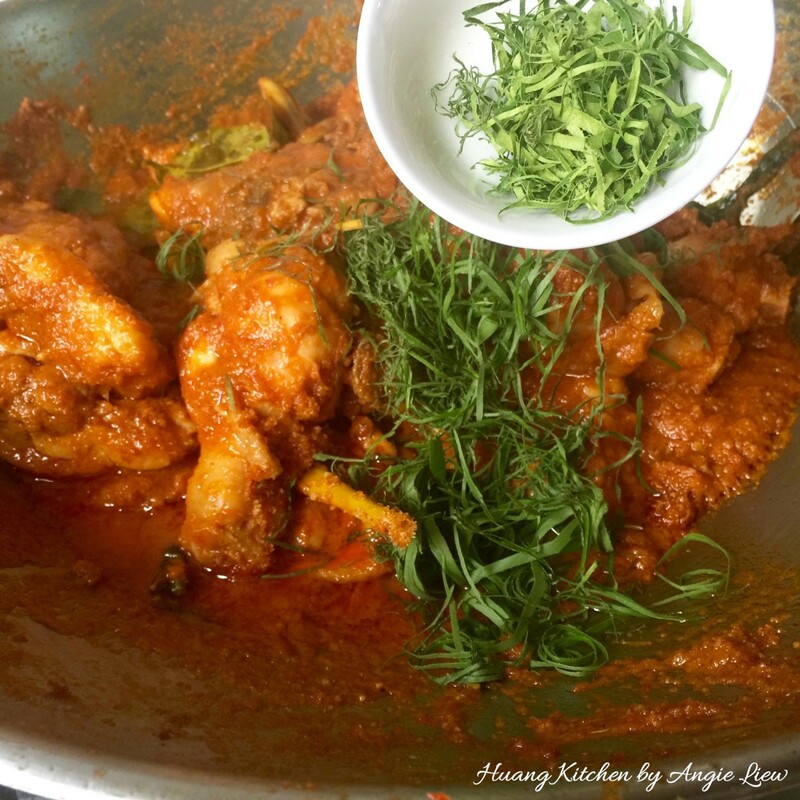 Remove turmeric leaves, kaffir leaves and galangal from dish before serving. Rendang always taste better when served the next day. 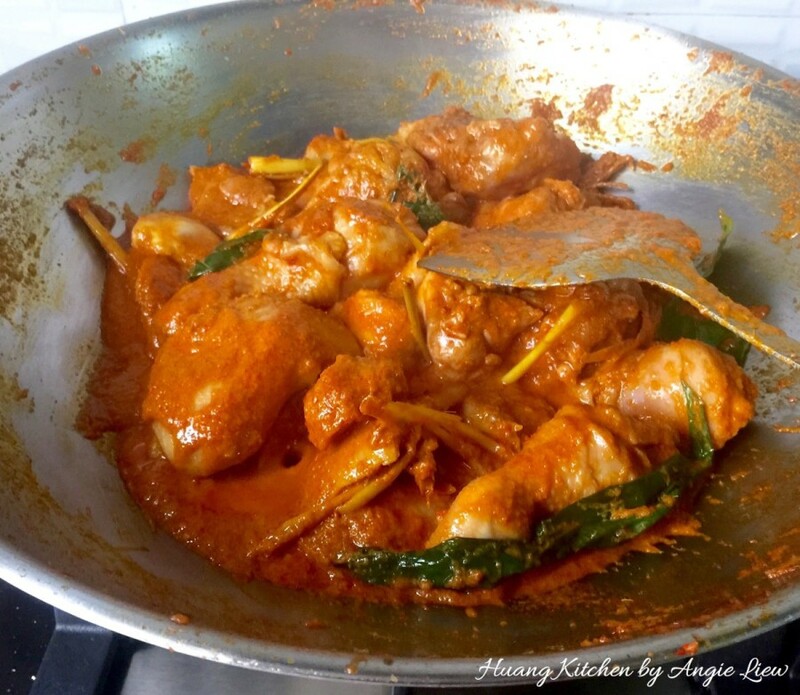 This dish has little gravy and chicken must not be overcooked or rendang will look messy with chicken meat and bone separated. The cooked spices (rempah) can be divided and packed into bags to be chilled or frozen for future use.